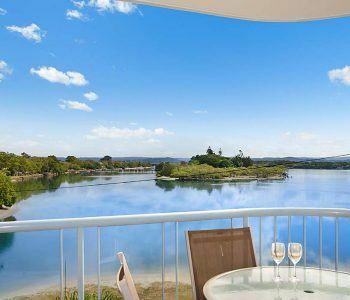 These affordable one, two and three bedroom apartments at this Maroochydore riverfront holiday accommodation are all self-contained with open plan living and dining areas, large kitchens and balconies. The other features you will love about these apartments are the fully equipped kitchens with dishwashers, microwaves and full laundry facilities. There is broadband Internet access, Austar, DVD players and a lock up garage. What more could you possibly need? Wait a second because there’s more…. 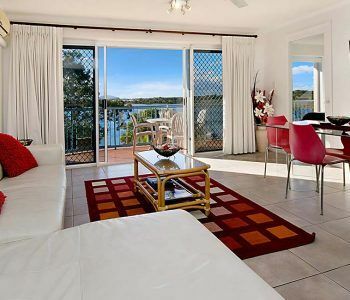 This is riverfront accommodation in Maroochydore located right on the banks of the Maroochy River. Enjoy great onsite facilities including easy access to the river, a swimming pool and heated spa, barbeque area and so much more to enjoy. You will love the great location of this accommodation, you are right in the heart of the Sunshine Coast and right in the middle of Maroochydore, you can walk to almost everywhere you need to go and the beach is only a short drive away. Treat yourself and your family to this memorable holiday on the picturesque Sunshine Coast and let it be as relaxing or adventurous as you want it to be. Each and every day can be different with so much to explore and discover; you can lounge by the pool or at the beach and enjoy the relaxed vibe or this waterfront location. Hike, sail, kayak and explore more of this stunning area. Do as little or as much as you desire and enjoy the holiday or a lifetime with your loved ones. 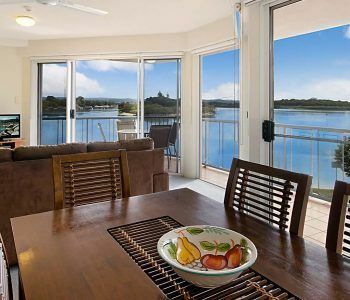 Another crowd pleaser is the stunning views of the Maroochy River from your north facing balconies, you can sit out there and enjoy morning coffee or watch the sunset at dinner, the options are endless when you choose to stay at this Maroochydore riverfront holiday accommodation.